There are a couple of reasons I sought out this book and read it earlier than I thought I would. Apparently it’s been climbing the charts since it was translated from Japanese into English this past fall, but for me it first came to light when my friend, Carlie, started posting about it on Instagram. For those of you that have been following for a LONG time she got me to read The Hunger Games way back in 2010. I still haven’t read the other book she recommended, The Beans of Egypt, Maine, but I should probably get on that as she’s two-for-two. After I asked about the book section of this tidying book she sent me the entire section via PM and I realized I wanted to read this book. I’m moving in August so it was the perfect time to take a look at all of my stuff so I grabbed a copy and devoured it. The greatest fear for me going in was that I wouldn’t want to do anything in the KonMarie method, but in reality I was already doing my own modified version. I fully plan to implement some of her techniques into my own already evolved efficiency/tidying routine and hopefully I will see some great results. (No clue if I will follow-up, so don’t hold your breath.) If there was one thing I was worried about, but most interested in when it came to the KonMarie method it was my books. I can name 10-15 books without even looking that I can pass on to another home because I bought them to read because I wanted to and now have no interest to. Just because I keep a book blog doesn’t mean I have to keep every book I purchase/receive. KonMarie makes an incredibly important note towards the end of the book that also provided a lot of relief for me, especially around my book anxiety. In essence she says, whatever your passion is it will be represented with more things. A little light went off and I did a little dance in my head because I realized I would only be eliminating the books that didn’t spark joy for me. After breathing a sigh of relief over this, I was able to move on to what was and will be the biggest hurdle in personally deciding on the KonMarie method. Whereas KonMarie has you interact with everything on a personal level, I have just sort of molted my belongings every few years with almost a complete purge. At first I was very skeptical of her thanking each item for its use and putting them back in their specifically assigned space, more so the latter, but the more I thought about it the more it just makes sense. Sure you own these items because you’ve paid for them, but how many of them could we get by without? I would be lying if I said I didn’t tear up a bit. I mean hey, WALL-E made me cry, so how much of a stretch was this? So what does it really hurt to thank your house when you come home from a long day, or thank each item for what they brought to your life and taught you while they were with you for a brief time? No one and nothing, that’s who. I think the biggest problem of the KonMarie method is that unless you live alone you’re going to face an uphill battle with getting others on board. You can reduce your own possessions down to only what brings you joy, but outside of that you must have the patience and the goodness to let everything else go. I know I’ll be doing some major decluttering in my life and if I can convince my boyfriend to declutter just one thing (the storage unit) I’ll be happy. Who knows if it will work, but if I can live with what I enjoy then I count this book as a resounding success. Just so you know it’s not all sunshine and roses, there has been a lot of push back about the KonMarie method including this article, that mostly just made me want to smack the author for sentimentality and knee-jerk reaction. Recommendation: Take it or leave it. I fully plan to give a copy of this book as presents this coming holiday season to quite a few people. I’m not sure if any will ever read it and appreciate it, but I know if I ever live alone I will only have what inspires joy in my house. I need to give this book to my boyfriend. He has put his stupid coffee thing in the loft. We will never user it and by the time it comes out of there, who would want to? It will be like my parents 40 year old vegetable cutting machine that my mum keeps trying to palm off on me. It isn’t even a proper thing, just one of those over priced capsule things. Why not get over that at least grinds up coffee beans or one of those filter ones that keep it warm for you? I while like to say to it “goodbye and good riddance” and then give it a solid kick out the door. 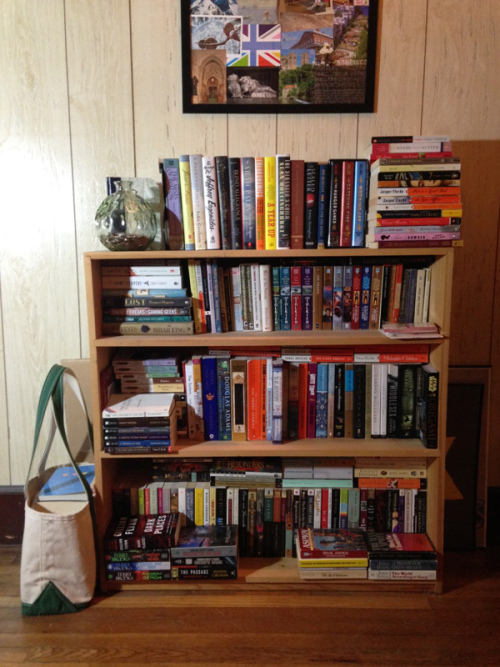 As for my books… I think I’m reasonably good. Over the last couple of years i have thrown out probably over 100 books. Moving house twice helps otherwise they just sit there. If i finish a book and didn’t like it, our only so so, it goes to charity. But i probably do keep quite a few more than i need to. I do kiss my book if i am enjoying it, does that count I wonder? Not as many as my boyfriend though. He keeps then all even if he will never read them, never liked them – just because they were a present from an uncle he rarely sees – that he was given when he was ten. If we are to say thanks to objects we appreciate, how about ones we do not? Am i allowed to kick my backpack for being useless? It will soon be replaced! I will enjoy throwing that out. Garbage. Gah! Haahaa even the things you hate you’d thank. You would say thank you for teaching me not to trust this brand or thank you for what little you did. It’s definitely worth the read but you would both have to read it for it to work best! I think I would get more from kicking it to be honest. I’ll thank it once it is sitting in middle of the lawn for providing such a good means of anger management. Haahaa I think technically that counts in the KonMarie method. As long as it’s gone if it’s not causing you joy! I keep going back and forth on whether I want to read this book; I like some of the ideas I’ve heard about, but some of the other ones just seem silly. Your post has renewed my interest, though! Maybe I’ll see if the library has it. It can be taken as a joke and I feel like a lot of people that do take it as a joke don’t finish it or don’t understand it. I thought it was a great perspective. My favorite bit of the book section was when she said that the best time to read a book is when we first encounter it. That’s so true. Some I know I’ll never read because their time has passed and I can let them go. I should probably practise this. As it is, I doubt I will read all of my books in my life time. I will maybe pass them onto my children (if I have any) or nieces/nephews as an heirloom. I have been on the waiting list at the library for this forever!! Now that I’m done with school, I can see exactly how much clutter has accumulated around here – especially in the past three years. I really need to get the inspiration and motivation to really clean house! Oddly enough, books are the one thing I DON’T have an overabundance of. I have made it a point to donate bags of books to the library at least 3 times a year. It’s just everything else!!! I think that really helps! It has to be a really special book for me to hold on to forever. As in I have only two shelves that are forever books. I was trying to get on the hold list but saw how long they were and splurged on the $7ish Kindle copy because of the move. I’ve heard a lot about this book and your review has re-inspired me to read it! I’m also moving in a couple of months, and I’d really like to be able to part with some of my stuff. Just looking around my apartment is making me want to rush right out and buy it…:) Hope your move (and decluttering) goes well! Definitely give it a go! Even if you don’t buy into it 100% it’s great for getting rid of a lot of stuff in one go 😀 And thanks, you too!